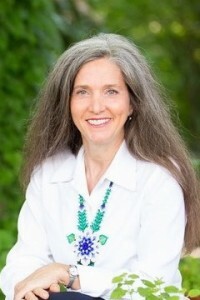 Lisa Lichtig has been a medical doctor and plant spirit medicine healer for over 15 years, completing her training with Eliot Cowan in 1999 and is inducted as a Lay Spiritual Healer in the Temple of Sacred Fire Healing. Like many of us, Lisa was deeply connected to nature as a child. She climbed trees and truly made friends with the plants and animals despite living in the suburbs of Detroit. She continues to immerse herself in the friendship of the plant spirits where she lives with her husband in rural North Carolina. Lisa also loves and accepts people in all their quirkiness and diversity. After studying anthropology in college, Lisa felt called to understand and help people by connecting with them as a medical doctor rather than digging up their bones. She went on to study clinical herbology with Tieraona Lowdog in 1991. Seeking a deeper friendship with plants and a more effective way of healing, Lisa was fortunate to have learned about Plant Spirit Medicine from another physician colleague and began studying with Eliot in 1998 from a pure place of trust, never having even read the book. She now holds a monthly PSM book club and maintains an active plant spirit medicine practice at Family to Family in Asheville, NC. For over 20 years, Dr. Lisa has woven nutrition, bodywork, counseling and herbology into her practice as a holistic family physician. While these approaches can be helpful, Lisa continues to hear people’s longing for something that is missing. The healing from plant spirits can effectively respond to this longing in a very mysterious way that is often unpredictable and inexplicable but happens nonetheless. It has something to do with emotional fluidity, respect, friendship, humility, laughter and acceptance. The plant spirits have a way of weaving us back into the tapestry of life. It is a joy and honor for Lisa to help people in this way. In 2014, Lisa was initiated as a Mara’akame in the Huichol Shamanic Tradition after a 14 yr apprenticeship. She continues to offer plant spirit medicine as a foundational healing. When needed, she also offers traditional healing as a Mara’akame.